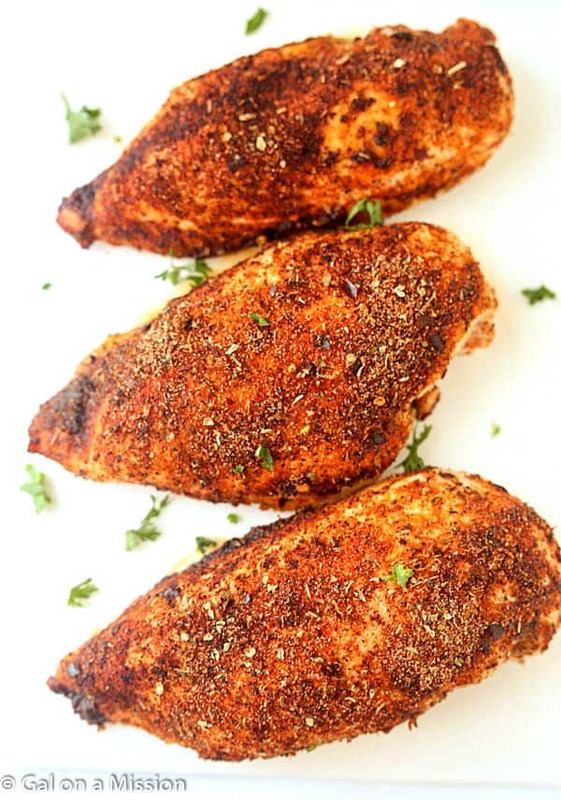 Baked Cajun Chicken Breasts – Oh, so juicy and flavorful. Delicious on sandwiches, salads, you name it! 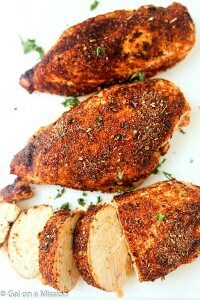 For sometime now I have been trying to perfect the best darn good cajun chicken breasts. Every time I made them something seems off. They didn’t taste just right.Not enough paprika flavor. Not enough flavor. Not spicy enough. Not moist enough. The list goes on. I have to tell you a little secret. 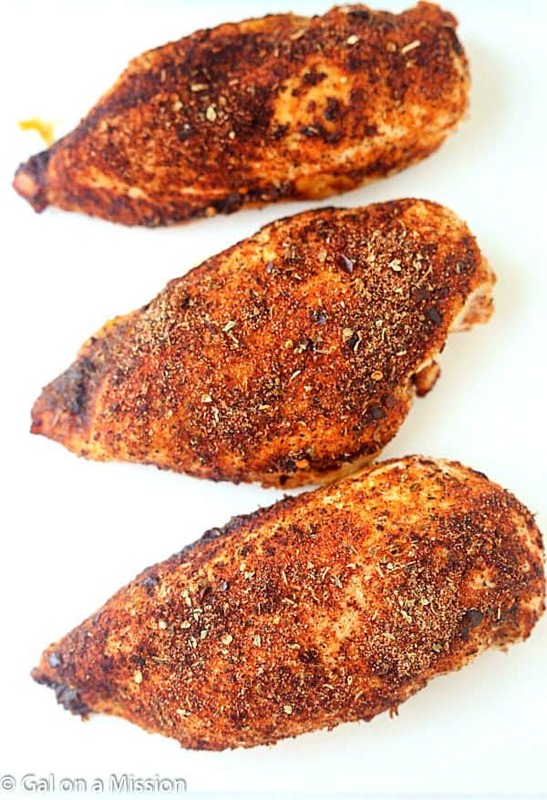 These baked cajun chicken breasts are absolutely perfect. Nothing is wrong with them, not even the smallest little thing. They are juicy, contain enough paprika flavor, the perfect flavor throughout the breasts, and spicy just enough to make you taste buds go crazy. Pure perfection, my friend. If you are looking for other chicken breasts, I highly recommend trying out cheesy bacon chicken breasts – only a few ingredients are needed. If I ever get a chance to do food prep, I like to keep a couple of these chicken breasts in the refrigerator for a quick lunch or dinner. They make the best chicken sandwiches and perfect on top of salads. How do you normally bake your chicken breasts? Medium heat, 350 degrees, for 45-minutes? High heat, 450 degrees for 18 minutes? We usually always bake our chicken breasts in an 8×8 baking dish, or larger depending on how many we make. In order to contain the perfect chicken breast, in my opinion, I like to bake them at a high heat, 450 degrees, for a short amount of time, then remove them from the oven and cover with aluminum foil for another 5-minutes. They are crispy on the outside, juicy and tender on the inside. Preheat oven to 450 degrees. Grease an 8x8 baking sheet or dish. Set aside. Mix together the salt, cayenne pepper, crushed red peppers, garlic powder, paprika, pepper, onion powder, dried oregano, and dried thyme in a small ramekin. Hello Chelsea, This looks delicious and I would love to try the recipe! Just wondering if you used skinless chicken breasts. 3am, too early to cook but my taste buds are begging for a butter garlic cream sauce to go with this. Or perhaps leave off the cream and add lemon juice instead. There, I feel much better already. Lovely recipes and of course the crunchy apple doesn’t need a review, ever. Hugs, Reg. imscared to under cook. will leaving it in the oven for an extra minutes harm the chicken/ can i use the left over chicken when it is cold in a salad. If you are scared to undercook the chicken, I recommend using a meat thermometer to test the temperature and making sure chicken is at 165 degrees F. Leaving it in the oven can dry out the chicken. I hope you enjoy it, Rick! Should you use all the spices that were mixed together on the chicken so theres none left? Or should there be left over? There shouldn’t be any leftover, Jessica! Enjoy. This looks amazing! My question is when you say cover with foil do you mean take the tray out and put a pc of foil over the top or actually take the foil and wrap it arnd the chicken breast? Great question, Anjali! You only have to cover the top of the dish with foil. 🙂 Enjoy. I did it the way you said, without covering it and then putting the lid on for 5 minutes at the end – it was absolutely delicious! Thanks for teaching me new cooking techniques! So glad you enjoyed it, Breanna! Sounds like a perfect dinner, Dave! Oh my, that sounds wonderful – Benny! I will have to try it with chicken thighs! I highly recommend using a tool like My Fitness Pal to calculate nutrition information, Violet. Have you ever used frozen chicken breasts? Hi, Erin! You can use frozen chicken breasts, just make sure you thaw them first. Enjoy! Making these tonight! When covering with the foil for an additional 5 minutes, do i need to bake it in the oven for those 5 minutes or let it sit out covered? Very tasty dish if you like spicy! I used the leftovers, sliced up some onion and make chicken salad which was also delish! Thank you!? That chicken salad sounds fantastic, Kristin! Yum! Going to try this recipe tonight! So simple and I sounds delicious too! to you rub on the spice mix on bare chicken breasts or do you coat them in some butter/olive oil to help it stick? I will be making this tomorrow and instead of using chicken breasts I will be using tenders. My family is not a big fan of bigger pieces of chicken. What would you recommend for oven temp and how long to cook for ? Hi, Jessica! Great question. I have never tried this recipe or with cooking chicken tenders this way. You will need to cut the time by a lot and perhaps the oven temperature. I would say 350 for 15-20 minutes, maybe. Please let me know what you end up doing! Took about ten minutes for the tenders to cook at 450. The spices only fully covered three and a half tenders. In the future I’ll double the spices to make six tenders FULLY covered in spice. It was good, thanks. Oh and I skipped wrapping the chicken in foil, I just lined a cookie sheet in foil. Sounds delish!!! Just about to bake and eat up.. I rarely find the need to comment on recipes, but I made this chicken last night and oh my gosh, it was AMAZING! Perfectly seasoned, juicy, delicious chicken. Made a whole batch to eat during lunch this week, and I’m sure it’ll become once of my staple recipes. Thanks for sharing it! I’m going to try this recipe tonight! Do you have any suggestions for sides to serve with the chicken? Almost any vegetable, mashed potatoes, or even a side salad pairs well with the flavors. Enjoy, Kristine! I made these a few weeks ago. Really good! From now on I will always cook my chicken breasts at 450 for about 18 minutes, then cover with the foil. These came out juicy… not dry. Thanks! Both these chicken recipes sound and look delicious…..anxious to make them both…..
Is this spice rub the same that you would buy in the grocery store?.. Cajun seasoning? Hi, Laurie! You may also purchase it at the grocery store, but I also recommend making it homemade. Tastes so much better! Perfect, perfect recipe! Didn’t change a thing, and it was juicy and perfectly cooked. The best ever. I found your recipe in a total pinch. Had all the ingredients and a half hour later it was ready. Amazing! Thank you! I would, Amber. I’m not sure the exact measurements you would need for only two chicken breasts. Just use the whole recipe. Extra goodness! Thanks! I just made this cajun chicken! It was spicy, easy and delish!!! So glad you enjoyed it, Candice! I found this on pinterest and made it tonight. I used a 1/2 tspn more of crushed peppers than the directions gave because I was distracted, but it was still amazing. The husband loved it and now he wants to try the rub out on some chicken wings on the grill. I give this recipe an A+! Made this last night for dinner with a side of mashed potatoes and wild rice. It was a hit. My husband absolutely loved it and said he would eat it again. The flavor was perfect and not over bearing. This will definitely be a part of my rotation. This recipe was absolutely delicious! I used thin sliced chicken breasts and cooked them for about 12 minutes at 450 and covered with foil for an additional 3 minutes. The chicken has great heat, flavor and was so moist!! Thank you for sharing this recipe! So glad you enjoyed them, Rosemarie! LOVED this recipe!!! I made it again but tweaked it and substituted boneless skinless and used smoked paprika! Whoops! Meant to say: LOVED this recipe!!! I made it again but tweaked it and substituted boneless skinless chicken thighs and used smoked paprika! I have made this chicken more than once. It comes out perfect every time. We love this so much we are having it again tonight. What an awesome recipe! Thank you so much for sharing it. It’s definitely a staple in my kitchen, Steve! So glad you enjoyed it. I plan on making this recipe tonight but just noticed I’m out of tin foil! Do you think it would have the same effect if I use parchment paper? It’s the closest thing I have! Hi Kayleigh, I think the parchment will be fine since it’s only going to bake for 5 minutes. It’s F. All of my recipes are written in F. Enjoy! I have been cooking for 32 years and have never been able to cook a baked chicken breast (or grilled for that matter) and have it turn out moist. This recipe is genius! My chicken turned out perfectly moist and delicious! I am planning on using this high heat method with other seasonings such as lemon pepper and rosemary. Thanks for the great idea! Made this and it was delicious. Hot but tolerable. Made this it was very tasty. Hot but tolerable. Was good for days after. Doing these tonight for dinner, the kitchen smells great with are the spices and herbs. I KNOW this dish is gonna come out well. THANKS!!! I’ve been making these at least every other week for the last year. It’s gotten to a point where I’ve just made a giant batch of the seasoning because I make them so often. They are so easy and delicious. I’m a student, plus a varsity athlete, so I’m low on time/ money. I tend to make a couple things that I can heat and go and these chicken breasts often end up in my pre-made meals because they’re so easy to make, taste AMAZING, and they’re healthy on top of everything else. MY husband was looking for a new way to prepare chicken breasts when he found your recipe. We tried it tonight. It was wonderful, moist and flavorful. We will be sure to add your recipe to our arsenal of healthy recipes. Thank you for sharing! Just used this recipe. It came out bomb! The chicken cooked just right and juicy! Thank you so much for sharing. This is really good!! I have been looking for a good Cajun chicken recipe too! We are having it over homemade Alfredo pasta tonight for my daughters 20th birthday dinner. Always nervous to try a new recipe on a special occasion. Glad I did. My daughter and I just tasted it. So tender and juicy! Thanks! DELICIOUS! Thank you SO much for this recipe! Last night I tripled the rub and covered two whole chickens, cut-up. It was the perfect amount. I baked at your temp of 450* for 25 minutes, then covered with foil for another 5 minutes. Then I removed them from the oven and let set for 5 minutes before serving. They were PERFECT! Tender and juicy; I was surprised! I served them with a dollop of vegan sour cream for a cool contrast and my family of four were addicted! Lol. To complete the meal, I baked (at the same time) a pan full of cut up sweet potatoes and apples tossed with maple syrup and a few other ingredients, and some steamed vegetables. YUM! I will keep this in my favorite recipes! The Cajun chicken recipe is excellent!! Hi, I was wondering to make this is it a good idea to prep them and leave it in the fridge overnight to bake the next day? Hello, I’ve never really left a comment on online recipes before, but the result of this recipes was amazing. As an amateur in using the oven, following your steps I achieved in making the juiciest chicken thighs I have made so far with the oven. Thank you so much, will be looking out for your recipes from now on. This was SO good! The chicken breasts I used were pretty thick, so I did about 32 minutes then put on tin foil and had it sit in the oven with temp off. I actually had to run out and worried it would be so dry from being in warm oven. So not the case. It was insanely juicy. We had ours with some leftover chili and it was awesome. Definetely going to use the tin foil idea more often! Thank you! GREAT GREAT GREAT. This is a no-fail recipe. I have given this to so many people and everyone loves it: chicken is cooked to a turn and the cajun spicing is delicious. In fact, it is so good, I double the recipe to make sure that every little part of the chicken is well-coated. One question: What is red pepper? I have no notion what it is and the recipe is fine without but I am curious. It’s crushed red pepper flakes. I just made this and my my it was spicy like I love it and juicy just like you said. I was scared about the short cooking time but it was perfect! Thank you so much!! Is there a dipping sauce you would recommend? Hi Kelly! I wouldn’t recommend a dipping sauce because it’s great on its own. If you try one, please let me know how it is!